Ceramic VS Titanium Flat Irons - How Are They Different? We get asked many questions about the different features of flat irons for straightening hair while the argument of Ceramic Vs Titanium Flat Irons gets tough! That’s ok too because it’s our job to give you as much accurate information as possible about different hair tools. It’s a job we take a lot of pride in too. Many of the questions we get surrounding flat irons have to do with heat plate infusions and coatings. One question we seem to get asked very often is whether a person should buy a flat iron that has added ceramic coating or titanium coating on its all-important heater plates. We will attempt to answer that question as thoroughly as possible in this article. Before we get started it’s worth noting that these two types of heat plate coatings are actually close cousins. By saying that we mean that some of the benefits they offer to flat iron users are very similar in nature. We will also state that you can never go wrong having either of these heat plate coatings on any model flat iron you own. As a matter of fact, they are both such popular flat iron heat plate coatings that you will see them used even in combination with each other. There you go. We just gave you an easy solution if you can’t decide which one of the heat plate coatings you like best on your flat iron. We thought it would be best to take a look at each type of heater plate coating individually so you can better see its value when added to any flat iron’s heat plates. You will not find any more popular flat iron heat plate coating than ones with ceramic coatings. 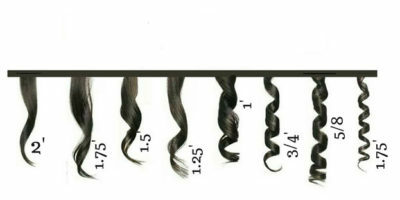 That is because they are very effective at adding a wide range of benefits to any flat iron model that has them. They are also found many times working in combination with other flat iron heat plate coatings or infusion. Ceramic heat plate coatings allow for faster heat up times. 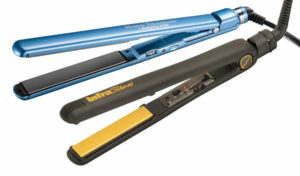 Flat irons that use this technology are often ready to use in under 15 seconds. This type of heating not only works fast but it also produces very even heat across the entire heat plate surface. That means there is less chance you will damage your hair using ceramic coated heat plates because they do not produce damaging hotspots. Ceramic coated heat plates are very smooth in nature. This allows your hair to slide across them unencumbered as you are straightening your hair. There is nothing that will slow down hair straightening more than having hair that drags or catches as it slides across the flat iron heater plates. 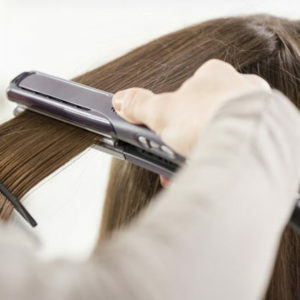 It tends to help keep the price of a flat iron down because it’s a very cost-effective technology to add. Ceramic heat plate coatings produce a small amount of negative ions which helps reduce static electricity and helps give your hair some shine too. 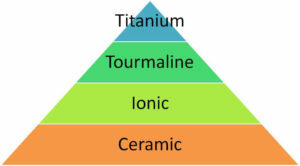 Not all ceramic coatings are equal in performance. That is why it’s important to read the reviews as to how people feel an individual flat iron with ceramic coated heat plates is performing. While titanium coated flat iron heater plates are not as commonly found on flat irons as ceramic heat plates are they still offer some great value. They even do some flat iron tasks even better than ceramic coated heat plates. They are almost always used in conjunction with other heater plate technologies. You will even see titanium crystal infusion used in some flat iron heat plates because it helps to keep a flat iron’s cost down. There are no faster heating heat plates than those with titanium coatings. They are often ready to use almost instantaneously. In a very similar way to ceramic heat plate coatings, they distribute heat very evenly which helps avoid the appearance of damaging hotspots. Titanium coated heat plates also make a very smooth surface for your hair to slide across when you are straightening it. Adding titanium coatings to flat iron heat plates is more costly than adding ceramic heat plate coatings. Titanium flat iron heat plate coatings do not offer any significant benefits as far as protecting your hair from damage from over-drying. Which One Will Work Best To Help Straighten And Style Your Specific Hair Type? Based on the above information you would have to give a slight edge to the ceramic coated flat iron heat plates. That is due to the fact that the small amount of negative ions they produce which has some additional benefit as far as protecting your hair from damage. Other than that it’s too close to call between these two flat iron heat plate coatings. Either one or both are great to have applied to the heat plates of any flat iron that you purchase. The Best Flat Irons for Every Hair Type and Budget!